We tranship fish, just as we do corals, so you can order a box packed for you from the original source. You choose what you want in the box from the suppliers&apos; lists. Your fish do not get cherry-picked on the way, just like with the corals. What is packed at the source by the exporter, you get. There is the occasional DOA, and the occasional substitute (usually a similar item), so if that is out of the question for you, this might not be for you. Overall it works out well. It is a good way to get many fish you might not be seeing locally, often for less, so say many of our hobbyists customers. Most sources are 10-20 fish in a box, unless small (more), or large (less). We carry many of the &apos;hand or net caught only&apos; sources, like Kenya, Sri Lanka, Vanuatu (closed), Fiji, and Red Sea, etc., these fish are very high quality. We have several Bali suppliers, only one of the master lists is posted so you know what Bali has. We also have a couple Philippine suppliers that have fish of such great quality you would be amazed. If there is something you want and can&apos;t find, ask, all the lists are not up. You need a place to acclimate and house them when they first arrive. Of course we advise all just-arrived fresh fish be quarantined prior to putting in a show or display tank. It is the best management practice. See our article on quarantine. The article on acclimating fish can give some tips on doing that too. In a word, dip, and never mix foreign water with yours. Upon arrival to LAX, after Customs and Fish & Wildlife, the fish are acclimated into new water, then repacked into new bags, bags are purged to fit maximum fresh new oxygen, and are put on your flight to you. We will advise of the shipping and pickup details at that time. You'll pay domestic (from LAX to you) freight directly to your airline when you pick up, which runs $80-100 for a box; often barely more for 2 boxes, just a little more for 3 boxes. The minimum rate is paid for the first box regardless of weight. Most sources arrive at LAX on a Sunday, and to you on a Monday afternoon, though Fiji is a Tuesday or Thursday at LAX, the next day to you. We can't do anything about international flight schedules. Click on a link to see the list of fish from that site. It will open a new window. When done perusing the list, close that new window that opened for the list and you'll be back at this main list page, select another list. Some of the lists have some pricing, others don&apos;t, ask if you are interested. Mostly we want you to see what is available, and from where they come. The lists below are examples of recent availabilities only. To view more current lists, check the .pdf links. Before creating an order, please contact us so we can send you the most recent list. To receive the most recent availability lists, please send us an e-mail. 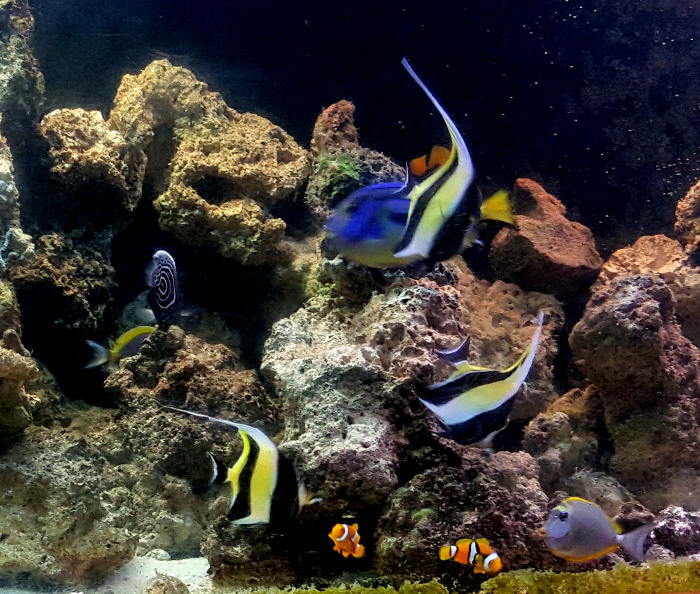 Thanks to our customer Gary L. for his pic of some of his Sri Lanka fish!